I’ve got a half-dozen works in progress, but only one of them has been getting very much attention recently. I’ve been making pretty steady progress on my Scrappy Trip-Along quilt, though I fully expect things to slow down for me now that classes are back in session, and my assistantship starts up again. Thankfully, the scrappy trip quilt is very stop-and-start friendly, and each block doesn’t take too long to go together. 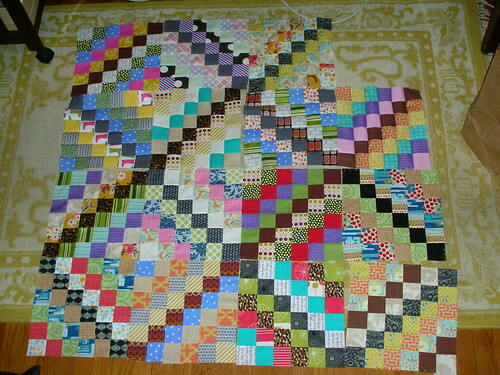 So far I have fifteen blocks, and it’s almost big enough that I’ll have to lay it out somewhere else soon. I made ten blocks straight off, start to finish, and then I made 20 6-strip tubes, which I’m still working my way though. Once I have all twenty sewn up, I’ll pull out iron and make all their seams lie flat — right now they’re still pretty puffy. I’ve decided to square my blocks up to 12″x12″ — I had hoped not to have to, but there were enough places where the seam allowance would have been really narrow that I didn’t want to risk leaving the blocks untrimmed. They look much neater, now, and I can live with the blocks being not-quite-perfectly-square on the sides of each block. If you like this pattern, check out the various projects posted in the scrappy trip-along flickr pool! Im working on a scrappy trip too! Aren’t they fun How big will you go. Your scraps look very fun. I’ve been debating making a scrappy trip for myself. I keep seeing them all over the web and they all look so great – yours included! Looks great! It looks like those scrappy quilts are hard to resist! Previous Previous post: Organization! It’s a wonderful, if short-lived thing.